A single sheet of paper covered with water is lifted carefully from a shallow pan as a group of women crowd around the table, watching with careful eyes. On a morning in June at the Hays County Extension office, just off I-35 in San Marcos, conservators and students from the UT School of Information are demonstrating basic salvage techniques for paper, photographs, and books drenched in this spring’s Central Texas floods. Pavelka has assisted with conservation efforts after the 2011 Bastrop fires, as well as hurricanes Katrina, Rita, and Ike, even traveling to Haiti after the 2010 earthquake. Along with her colleague Rebecca Elder, she coordinated the effort to organize workshops in response to severe flooding across the state in June. An old, unused flip phone of Pavelka’s became an emergency hotline for people to call and get advice on how to salvage their belongings. The next step includes events like this one, which is meant to teach flood survivors and volunteers how to recover damaged memorabilia. As community members are briefed on dry-cleaning wet paper, the necessary materials—gloves, respirator masks, tape, newsprint paper, nonwoven polyester sheets, paper towels—are organized neatly. In a lesson on mold removal, Pavelka warns how the threshold for growth starts at just 72 hours. This is the kind of information Diane Laumer, MA ’80, came to learn about. 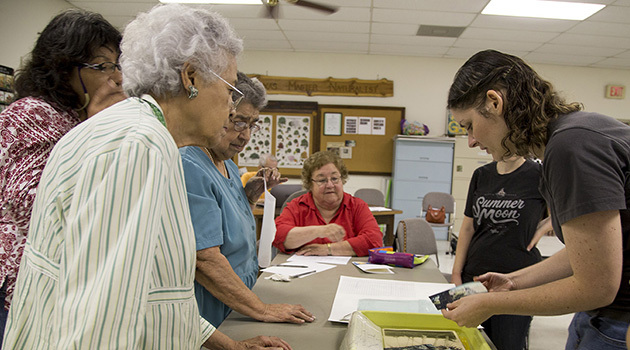 A retired educator, she saw the iSchool’s demonstration at a library in nearby Wimberley and decided to attend the workshop in San Marcos. “I’m not at a point where I can tear drywall off walls or pull up carpeting, but I thought, ‘Well, if I get a little bit of training in this, then I can help some people,’” she says. Laumer’s concern is the “just get rid of it all” mentality some homeowners have after seeing their things underwater and surveying the flood damage. She hopes to pass on the word within her network that something can be done for papers, photos, and heirlooms, although time is of the essence. Alana Varner, a UT graduate student in information studies and women and gender studies, was the perfect person to help friends the day after the flood. She set aside plans in order to drive into Wimberley, visit her friends’ childhood homes, and work to recover family memories. Together, they cleaned out and took apart a wedding album, along with other photos, a timeline of baby pictures all the way through adolescence. “I think we used every towel in their house to lay out all of the pictures and took over their laundry room, trying to get as much done in those first few hours as possible,” she says. Varner knew to avoid touching the photos, to only use clean water for rinsing, and to try and keep the fragile photos flat—a tip she learned from Pavelka’s class. Shortly after, the iSchool’s call for volunteers arrived in her inbox and Varner began assisting with workshops. “After working with my friends and seeing how important some of this stuff was for them, I definitely wanted to try to help other people save their things,” she says.